Nothing is more personal than a custom-designed fireplace. The appearance of a well-crafted wall unit with stone tiles and mantle can dominate the entire living room. Natural stone is the preferred building material for the pit, wall covering, mantle, and floor tiles. Many fireplace manufacturers offer prospective buyers a variety of design options, with the inclusion of marble, granite, ceramic, or travertine as an integral part of the customized look. Many of these manufacturers partner with trusted contractors who perform the actual installation. These contractors in turn will want to choose the most affordable source for top-quality building materials. Nalboor is a direct importer and distributor of granite, marble, and travertine building materials. We sell our products to retail merchants and home improvement stores. Some of our clients purchase our products for use in the construction of fireplaces. Granite, marble, and travertine stand up well to changes in heat and pressure. Some rocks – including manufactured brick – actually go through changes in structural integrity when exposed to high heat over a long period of time. Natural stone products are exceptionally durable, require little maintenance, and do not fade over time. At first, it would seem rather odd to consider using materials suitable for flooring tiles as part of a fireplace design. The truth of the matter centers around the strength and durability of these materials. Natural stone strips do not buckle, and support very heavy weights. The stone tiles used to create kitchen backsplashes, bathroom wall coverings, and decking surfaces are perfect for fireplace design. When one thinks of a fireplace, the first thing that usually comes to mind is the stone used to decorate the wall surrounding the firepit. The mantle that sits above the fireplace must complement these stones in terms of color shade and styling. The base of the fireplace and the stones used to cover the floor must be able to stand up to the effects of soot. It makes perfect sense to use high-quality stone for fireplace design, but the stone used must present a measure of visual appeal. The fireplace itself is part of a larger room design, meaning that the colors and styles used for the construction of a fireplace exterior must blend positively with other room accents. If the fireplace is constructed using materials that harshly complement other room accents, the visual appeal is lost. Granite, marble, and travertine are the three most commonly used stone materials in the construction of fireplaces. All three of these stone materials are affordable when purchased in bulk. Interior designers often choose a particular color shade and style of natural stone when designing a resort complex or condo development. The contractor winning the bid for fireplace construction will therefore scour the marketplace looking for the best possible deal on bulk orders of granite, marble, or travertine. The lowest prices on the highest quality products are found by going directly to the materials source. Natural stone products are fabricated from large blocks of raw material. The granite, marble, or travertine accessories used in fireplace construction were at one time thick sheets of rock extracted from quarries. Specialized cable saws are used to cut slabs from the quarry, and these slabs are then thinned down into narrower sheets. From these sheets, fabricated strips are shaped into a variety of products including window sills, countertop blocks, tiles, shower curbs, and floor thresholds. Natural stone is quite heavy, and shipping costs are high unless the product is delivered in bulk quantities. This is why purchasing larger amounts of natural stone results in lower per-piece pricing. Everything sold by Nalboor is in full-crate or full-pallet quantities. Because we import our products in such vast quantities, we can pass our freight cost savings on to our commercial clients. Contractors need a large amount of raw material when installing natural stone fireplace accessories in new homes tracts or resort communities. Although the work is staged over several building phases, the amount of material needed to complete the job is known well ahead of time. Nalboor offers clients the opportunity to obtain premium granite, marble, and travertine products at truly wholesale prices. Our product line includes the most popularly used styles and colors of natural stone. Because we own our manufacturing centers overseas, we can guarantee product availability throughout the calendar year. Natural granite, marble, or travertine make exceptional fireplace mantles. The larger sizes are up to 74 inches in length and 12 inches wide. Although the industry standard thickness is 5/8-inch, custom sizes can be ordered in wider, thicker dimensions. Black granite is one of the most popular shades for fireplace mantles. The dark color is very shiny, contains very little speckling or splotching, and complements lighter wall shades. The granite can be polished for a brilliant, reflective appearance, or honed to give it a subtler, darker look. Marfil and Carrara are the two most commonly used shades of marble. Marfil is cream/beige in color with moderate streak or splotch patterning. This shade is preferred by homeowners because it blends nicely with other neutral tones. Carrara white marble is stately in appearance. For more than two hundred years, this off-white shade of natural stone has been used in government buildings, particularly in the construction of columns, steps, lobby floors, and bathroom counters. Using Carrara marble for fireplace mantles gives the entire wall an elegant, classic appearance. Travertine is one of the most versatile of all natural stones. 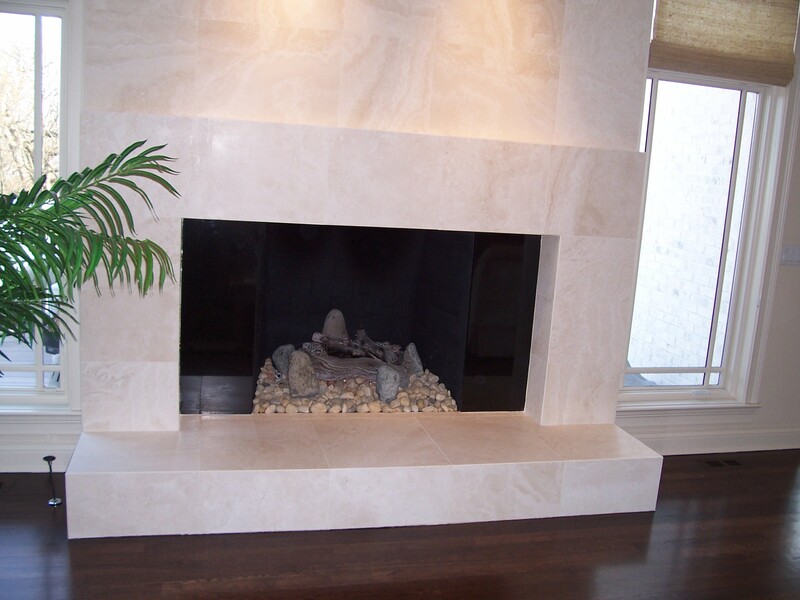 Ivory shades of travertine are perfect for use as a fireplace mantle. This tone blends well with darker shades used for the fire pit perimeter covering. In addition to our line of flat sill pieces, Nalboor offers commercial clients a wide variety of pavers, marble and granite tiles, and travertine sheets suitable for constructing tile coverings for the fireplace perimeter. Travertine is especially beautiful as a wall covering or floor surface because of its rustic appearance. When properly treated and sealed, travertine will last for decades without fading. Marble tiles offer designers a wonderful alternative to the traditional brick. The fireplace design can extend to the entire wall, and marble tiles can be incorporated into the wall covering so as to create an exceptionally beautiful backdrop to the other stones used for the pit and mantle. Marble thresholds – especially the Hollywood bevel variety – are commonly used to accent the base of the fireplace. Much like the placement of saddles for use as shower curbs, marble thresholds used as a sort of baseboard create a secondary accent that is visually stunning. Nalboor maintains a large inventory of products made from natural stone. We ship full-crate or full-pallet orders to commercial clients all across the nation as well as to the Caribbean. Our products are separated according to material, color, and style, and our in-house quality control team can prepare an order for shipment in just one or two business days. Clients needing a large amount of product for extensive project developments can set up a recurring order schedule with Nalboor. Most of our clients are retail merchants who act as dealers for our line of granite, marble, and travertine building accessories. These merchants are constantly filling orders for installers and need a reliable source of product at any time of the calendar year. The sales team at Nalboor will review an order request and give the client an accurate price quote as well as an estimated delivery schedule. Orders for non-standard sizes are specially fabricated at our overseas manufacturing facility. These orders are priced similarly to our standard-size products and require a lead time of about two months for processing and shipment. There is no sacrificing quality for low prices when doing business with Nalboor. Our company offers commercial clients premium quality natural stone at truly wholesale prices. Our bulk importing and distribution process allow us to pass savings along to the consumer, and our product reliability is second to none. If you need top-quality natural stone for the creation of custom-designed fireplaces, contact us today through our online form. You may also call us at (305) 501-4548 to speak to one of our professionals from the most affordable marble wholesaler in Florida! Customer satisfaction is our top priority, so expect truly personal service from Nalboor.